Note: Manufacturer has discontinued this item. 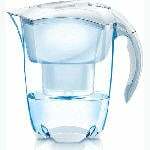 We recommend the Mavea Elemaris XL Water Pitcher Filter - Black. 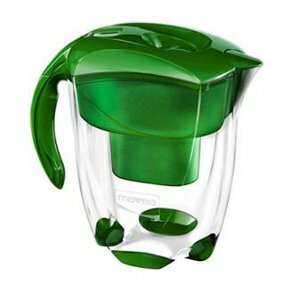 The Elemaris XL Water Filtration Pitcher Green 1005770 is a high quality water filter pitcher constructed with BPA-free plastic that features a distinct and elegant sage green European style. The Mavea Elemaris water pitcher will provide you with clean and clear drinking water through Mavea's next generation Maxtra filter technology and modern design. The Mavea 1005722 has a large 9 glass holding capacity and is additionally treated with silver to prevent bacterial growth, and also reduces chlorine taste and odor from your drinking water. The Mavea green pitcher also includes a Smart Meter filter change indicator that measures water hardness, water volume and length of time in use for your convenience. The Mavea water filter pitcher also includes an easy-to-pour lid and soft handle that make for a revolutionary and user-friendly design. In addition, the Mavea pitcher's filters can be recycled through Mavea's recycling program. Dimensions: 10.5" x 5" x 10"